Chevron Racing Cars made a stunning race debut in the GT Cup Championship (www.gtcup.co.uk) this weekend – with an inaugural victory in the ballistic Chevron GR8 GT at Brands Hatch Indy Circuit. 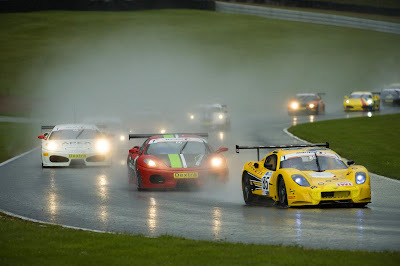 Rising star, Jordan Witt, just 20 years old, took a huge victory – by over 11 seconds – in the second of two sprint races in the Chevron GR8 GT Car, blitzing Ferrari 430’s and Porsche 911 GT3 racers to take the chequred flag in style, in the pouring rain. Jordan Witts in his Chevron leads the GT cup pack - including 3 Ferraris! 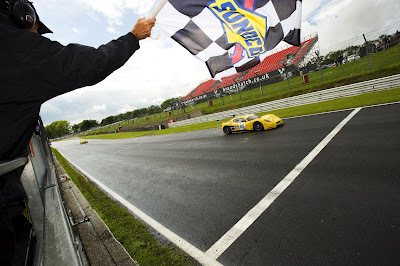 The GT Cup Championship Sprint (25 minutes) and GT Trophy Endurance Series races are designed for GT Cars with both up-and-coming racers, like Jordan, and “gentleman drivers,” like his father, David Witt – who was racing alongside his son at Brands Hatch in the Chevron Challenge Car. The Challenge Car runs mainly the same high specification as Jordan’s Chevron GR8 GT Car, with a re-worked version of the GT version’s full aero pack. Jordan has only been racing competitively for twelve months, in the Dunlop Sport MAXX Cup, Chevron GR8 Challenge and in the epic British GT Championship, in the Chevron GR8 GT. And the Cheshire race ace had just recovered from a dose of the mumps and a serious bout of conjunctivitis prior to the Brands races. But that didn’t stop him taking the c260 bhp, 750 Kg Chevron GR8 GT to a historic inaugural victory in the second of the two sprint races. Race two was a different story from the first race. The Chevron GR8’s were both using a dry set-up, with a slight rise in ride height and were running Pirelli full wets – for the first time. Jordan started in third place (based on qualifying laps, in the dry), but was up to P1 by turn three in the Chevron. The Chevron GR8’s will be racing again in the GT Cup at Donington Park on August 12th. And you can see the race report from Brands Hatch on Motors TV (www.motorstv.com) on Friday July 29th, 19:25, on Sky Channel 413 or Virgin Media Channel 545, with interviews with race winner, Jordan Witt.